Finishing up our look at each division as the season starts (for real this time) in Miami tonight. Suddenly this division looks a lot like its American League cousin. It will basically be a toss-up between the three top teams and a fourth, the Nationals, should really surprise people. I remain hopeful and optimistic in the chances of my Mets this year, too. Hard to quibble with that lineup of theirs. Lots of bright bombast from this newly minted organization with a psychedelic stadium, loud-mouthed manager, and one of the most exciting players in the game signing a big contract. 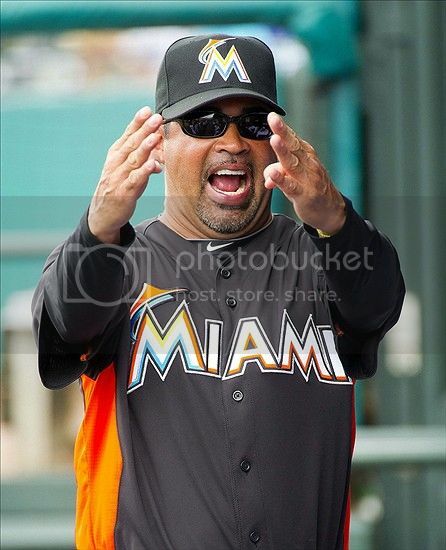 For years I thought this team's crappy on-field decision-makers have cost them wins but Ozzie Guillen has an equal reputation for being a smart tactician and a smartass. Look for him to have a huge impact. They'll certainly be fun to root against as they'll be pretty damn good and possibly very annoying. Hard to be too excited about their offense as they've definitely got some holes. The pitching is deep with loads of young talent, though. Bounceback years from Michael Bourn and Jason Heyward along with a big step forward for 22-year-old first baseman Freddie Freeman should propel this team into the playoffs. We all questioned their ability to score enough runs last year and they went out and won 102 games. Now they're missing most of their infield to start the year and Father Time plus injuries might finally bring this Phillies dynasty to a grinding halt. They've still got arguably the best trio of starting pitchers in the sport, though. I think their rebuilt rivals will present them with more adversity than they've faced in a while but they'll still make it into the playoffs. I took a close look at the Mets in a recent post and came away thinking they might actually be pretty good this year despite the horrible predictions and projections being spewed about. Their opponents in the division will be unforgiving and this group is definitely going to give up a nice chunk of runs, yes, but don't underestimate what might be the best lineup of any team in the NL East. The Davis & Duda combo shall instill fear in the hearts of men. Fourth place is the most optimistic scenario right now but if Johan Santana and David Wright can somehow regain something of their past dominance, there's no reason the team can't hang with the NL Wild Card contenders. The rotation looks dominant. In an era of steadily decreasing scoring, teams are loading up on starting pitching and the Nationals look like contenders all the sudden with four quality pitchers at the top of their staff. Nobody has any idea if Stephen Strasburg's body can withstand the incredible force generated by his throws but for now he's healthy and the team looks like a legitimate threat in a tough division. It's funny, as a long-time Mets fan I don't harbor ill feelings toward their key rivals in Atlanta and Philadelphia. But I can honestly say that I dislike both the Nationals and the Marlins this year. Just like the Marlins, the Nats should be a pretty good team and thus they'll be a team worth rooting against. Their spectrum of potential ranges from last-place to first-place but, in my eyes, the Mets are going to be better than somebody this year and I'll go with the perennially clumsy Nats. Even if that seems completely irrational.